There may still be a chance for an El Niño during the 2014/15 ENSO season. 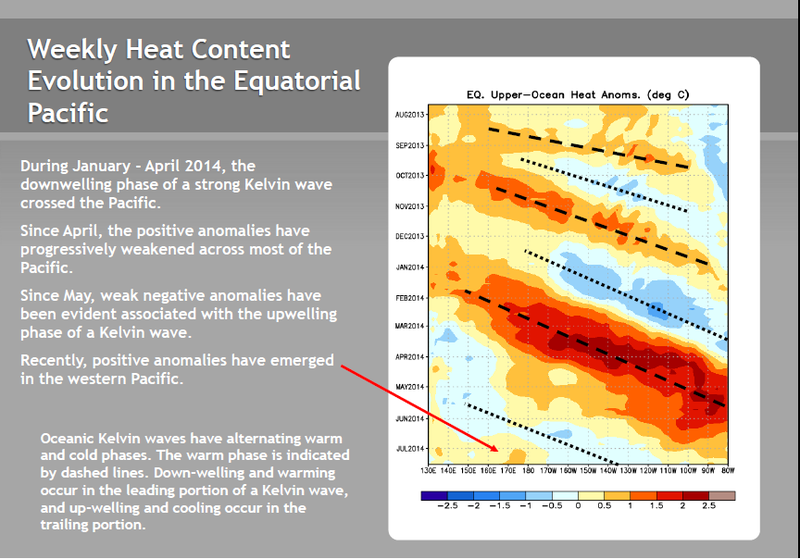 A new “pocket” of warm subsurface water has formed in the western equatorial Pacific. 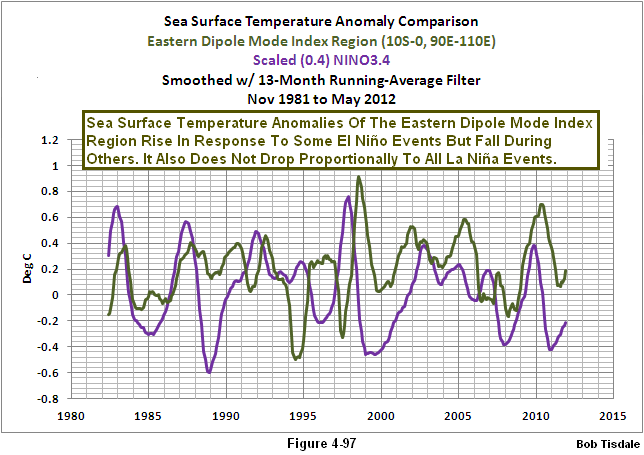 See the note in the page from the most-recent NOAA Weekly ENSO Update to the right. (Please click on illustration for full-sized image.) In their update, NOAA also makes note of that anomaly during their discussion of the Hovmoller on their page 15. That subsurface temperature anomaly appears to have been caused by the recirculation of warm water from the earlier downwelling (warm) Kevin wave, not by another westerly wind burst. Part 11 – Is the El Niño Dying? …of this series. And the bottom line of those posts was, if the trade winds along the equatorial Pacific did not start to provide the feedback necessary to support an El Niño, the 2014/15 El Niño was going to die an early death…basically, it would run out of warm water. 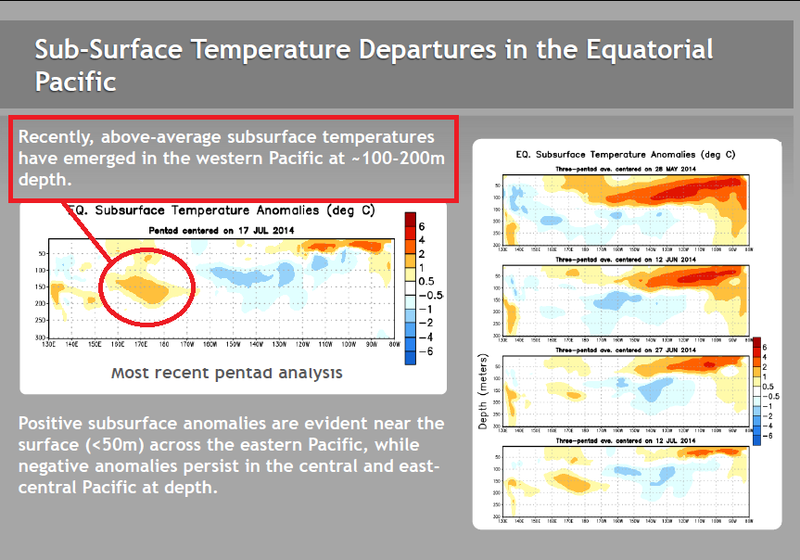 Now a warm subsurface temperature anomaly has appeared in the west-central equatorial Pacific. See Figure 1, which is the most recent (a 5-day average centered on July 22) equatorial cross section available from the NOAA GODAS website. That pocket of warm subsurface water has been there, growing stronger, for the past few weeks. Yet, according to the equatorial wind stress data, there has not been a westerly wind burst in the western equatorial Pacific for a few months to nudge any warm water from the West Pacific Warm Pool. See Figure 2. So where’d the warm water come from? For that, we’ll have to look at an animation of the temperature anomaly maps for the top 300 meters of the oceans. But before we do, let me first show you what you’ll be looking for. See Figure 3. There is a pocket of warm water off the equator near the dateline. That pocket of warm water will be isolated as the equator cools. It travels slightly west and then gets “drawn” to the equator again. And in Animation 1 you can watch that transpire. The animation starts with the May 3rd pentad (5-day average) and runs through July 22nd. For those interested in watching the off-equatorial pocket of warm water form, see the animation here of sea level anomaly maps and temperature anomaly maps for the top 300 meters of the oceans from July Update. The “T300” maps are on the right. That animation runs from the start of the year to July 2, 2014, so it does not capture the warm water returning to the equator. That’s only happened over the past few weeks. Animation 2 includes the equatorial cross sections for the same time period. Yes, there are other positive subsurface anomalies west of the one nearer to the dateline, so without the T300 maps, it’s difficult to speculate about how the larger warm anomaly formed. We’ll just have to watch and see what Mother Nature decides to do. She’s always in control…and she’s always full of surprises. 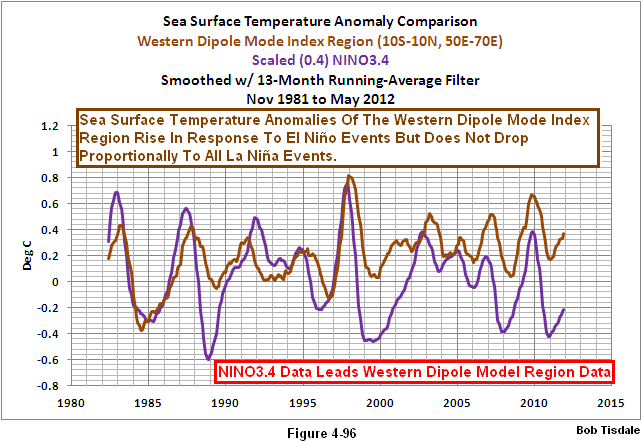 46 Responses to The 2014/15 El Niño – Part 14 – Warm Water Recirculated? In the animation figures with gray bars, could you explain the gray bars please. Are these areas where there are no sensors? Are they land masses? etc… And what if anything can we do to understand the transition across those gray bars as we scan the information across longitude? There is no opening other than the Panama Canal between the tropical Pacific and the tropical Atlantic. So you can’t suggest any water transport between the two there. Same thing for the Atlantic and Indian Oceans. Africa separates them. For the grey bar separating the Indian from the Pacific Ocean, there are bodies of water that circulate around those equatorial land masses. The Indonesian Throughflow is the surface current that carries water from the tropical Pacific into the tropical Indian ocean. I don’t recall, though, ever running across a subsurface current that carries water from the Indian to the Pacific…comparable to the Cromwell current in the Pacific that carries subsurface waters from west to east along the equator. So reading from left to right, would you mind labeling the gray bars and the white spaces? It would be very helpful to have this information somewhere since it never changes. For those new at reading an animated water column graph it would prove very useful. I’ll give it a try. Correct me if I error. The water column temperature is measured at the equator. The first gray bar is the eastern shore of Africa. The first white space in the Indian Ocean. The second gray bar is the Indonesian island masses, a highly active volcanic area of the Globe. The second white space is the vast Pacific Ocean. The third gray bar is the West and East coast of South America. The third white space is the Atlantic Ocean. And the last gray bar is the western shore of Africa. ‘cept for the typo in the 3rd sentence. Lovely animations! I am constantly amazed at how you are able to visualise this before you create the animation… you must have an “analog” model of the Pacific Ocean inside your head :-). So Bob, this “breakaway” pool of warm water is visually reminiscent of an eddy forming in a river flow? I suppose to try and model this, one would have to invoke a formula derived from chaos theory not unlike a Julia set or Mandelbrot figure? I only know enough about these to understand that no matter how faithfully one created the starting conditions the outcome can take many forms. So to attempt to computationally model this phenomenon would be almost futile? Certainly this would seem true with the data sets that are currently available, yes? James, it all depends on how closely you want your models to resemble reality. It would be nice if they’d make some basic effort to simulate the overall processes. Hi Bob, Is there any significance to the large anomaly both south east of New Zealand and a similar one east of Argentina. In terms of anomaly it appears they are larger in area and in absolute temp anomaly than what this post is about in the Western Pacific ? …and both anomalies appear to have been there for a couple of years–at least through 2011. And I checked a couple of months as well and they don’t seem to be seasonal. Hi, here is my weekly weather and climate column which BTW I prepared prior to reading your new post #14. http://econintersect.com/b2evolution/blog1.php/2014/07/28/july-28-weather-and-climate-forecast-mercury-in-retrograde. I read your post after I had submitted mine to my editor. I will not be posting this here regularly or at all but last week and this week I presented a lot of your information so I thought you might want to see how I approached that and my final conclusions. At some point I will be coming back to the PDO. Of great interest to me are the studies that seem to show that certain lag and lead number of years appear to have statistical significance re the changing sign of these two indices and there are some theories on why the timing of those two oscillations may be other than random. I am also very interested in the AO and NAO. I live in New Mexico and in a given year the state of ENSO may have the largest impact on us especially in the winter but over a multi-year period, the state of the PDO and AMO has probably a larger impact as per McCabe et al. I realize that ENSO and PDO are not independent phenomenon. We could talk more about that i.e. the location and strength of the Aleutian Low and the KOE (I loved your graphic on that) but I do not wish to monopolize your blog. I am just an appreciative visitor. I am not a scientist but a management consultant although I know quite a bit about weather modification as I am on the ASCE Weather Mod Standards Committee. So I have a pretty good understanding of precipitation processes. One of the things you talked about that is very interesting to me is the echo effect from one strong El Nino or La Nina to subsequent events. In fact that was probably one of the most interesting things I have learned this past two weeks going through your material. I was not tuned in to that before. So I now will resume being a lurker but definitely a very interested lurker. My major interest is the economic impacts of weather and climate but I am attempting to inform people about cycles since part of economics is the ability to either predict things or at least assess the probabilities of things. So understanding climate cycles is important. It did not work out too well for Kondratiev but hopefully science is more acceptable these days. You do a great job and provide a valuable service. Any thoughts on this from today’s updating of the August Outlook. Sig Silber, do you have a link for the quote? It appears to be a weather prediction for the continental United States, not an ENSO forecast. Yes t is a weather prediction for the U.S. here is the link. http://www.cpc.ncep.noaa.gov/products/predictions/long_range/fxus07.html I was just wondering what if any implications you thought this had for the evolution of El Nino. Here is the best map I could find on their location. http://www.jma.go.jp/en/typh/ They are both in the NH so it is not the classical twin typhoons. But #11 seems roughly where we both noticed some anomalies on Monday. You know more about this than I do but being a mathematician I notice patterns. One of your posters seemed to be saying that a cooling of the troposphere was a requirement for an El Nino to develop. I did not understand that. It seems that the prior Typhoon led t the intrusion of Pacific Maritime or Polar air into the U.S. Midwest via Canada. I live in NM and we have seen the 4Corners High knocked into Old Mexico but we are getting drenched from the back door fronts. So clearly there is a pattern here but I do not know enough to figure it out. One question I have is does this pattern have an impact on the tropical easterlies in the Eastern Pacific? And of course any relationship to Kelvin waves as these Typhoons crossed the Equator. I have no answers only questions but there does seem to be a pattern here of some sort. I should not say this because I don’t know enough but it kind of makes me thing that El Nino is really one year away not here as things are still happening too far west than they need to for a Eastern Pacific El Nino to develop. OK.I know I should not have said that because I do not know enough to say that. I also note that a Hurricane is developing in the Atlantic which again makes me thing that we do not have an El Nino here just yet. Sig Silber, the typhoons you were discussing appear to be too far from the equator to have had any impact on El Nino development. Regarding someone’s comment about the troposphere needing to cool for an El Nino to develop, there are lots of pet theories about El Ninos, few correct. It’s not too late in the year for an El Nino to develop. Even one as strong as the 1982/83 El Nino could develop if the necessary feedbacks kicked in, but those are big “coulds” and “ifs”. Atlantic hurricanes can exist during an El Nino. They’re simply less likely due to wind shear. That was back in Oct 2012 which I think was ENSO neutral time. So I am very curious about this possible pattern. Given the current observations and the climate model outlooks, the Bureau’s ENSO Tracker has shifted to El Niño WATCH status. This means the chance of El Niño developing in 2014 is approximately 50%, which remains significant at double the normal likelihood of an event. El Niño is often associated with wide scale below-average rainfall over southern and eastern inland areas of Australia and above-average daytime temperatures over southern Australia. Similar impacts prior to the event becoming fully established regularly occur. The Indian Ocean Dipole (IOD) index has been below −0.4 °C (the negative IOD threshold) since mid-June, but needs to remain negative into August to be considered an event. Model outlooks suggest this negative IOD is likely to be short lived, and return to neutral by spring. A negative IOD pattern typically brings wetter winter and spring conditions to inland and southern Australia. Thanks, Sig. They’re catching up with what we’ve known for about a month. The Australian proprietary model POAMA http://www.bom.gov.au/climate/poama2.4/poama.shtml has never called for an El Nino this year. They have reported on what other models have suggested but their own model has not been convinced. If this El Nino falters, a serous review of the models may be in order. If you have not yet read it you might find this article of interest. http://www.jamstec.go.jp/frcgc/research/d1/iod/publications/2colakjmsfnl.pdf I think they are reliable researchers so I am assuming they are correct when they say that with the 1997 El Nino the IOD was positive. Not that the IOD and ENSO are highly correlated but there is some tendency for El Nino and IOD negative to occur and the IOD was briefly negative and is currently negative but predicted to return to neutral. Also in that article there is a discussion of some oddities about the Walker Circulation in the 1997.El Nino and we know that the 1997 El Nino occurred at the time the PDO changed sign. So there may be some clues here as to what a strong El Nino looks like. I suspect your description of the PDO is similar to the description of the IOD namely it is a change in location of warmer versus colder water not necessarily a change in the average temperature of the water but you have another graphic that suggests there may be a combination of factors involved. It seems to me and again I am not even close to being a meteorologist (I can design a computer for you no sweat and I can evaluate the economics of any project, and if you want I can make rain as I know how to do cloud seeding and I am on the ASCE Weather Mod Standards Committee) but without being a meteorologist, it seems fairy obvious that the configuration of Walker Circulations is related to the pattern of warmer and cooler water along or near the Equator looking at the Pacific and Indian Oceans as pretty much one body of water. And there is where your IndoTropicalWarmPool or whatever it is called comes into play. So it seems to me that if someone wants to call for a strong El Nino they need to look at the bigger picture of what is going on in both the Pacific and the Indian Ocean and that might involve considering how those cycles are reinforcing or cancelling each other out. I do not believe that just looking at the Pacific is sufficient. This is clearly simply a layman’s perspective, a perspective which includes a belief that nothing happens by chance and everything can be explained. Explaining is different than spinning. I can’t wait for tomorrow to find out how NOAA explains the disappearance of the Southwest Monsoon which IMO never got started this year and find out if the ENSO Report continues being as optimistic about El Nino as they have been and how they explain that Nino 3.4 is negative etc etc. Sig, thanks for the link. I commented on the Indian Ocean Dipole in Chapter 4.13 of my book “Who Turned on the Heat?” Here are two pertinent graphs from that discussion. Sig, thanks for the links. There’s lots of research about the impacts of ENSO on tropical cyclones around the world. I believe William Grey was the first to study the subject back in the 1960s. I don’t spend much time on the subject. My research has always been geared toward the impacts of ENSO on global surface temperatures. My interest was does this behavior support or reject the notion of an El Nino this winter. The paper was very interesting as it seemed to suggest that the route of the Hurricanes is different in El Nino versus La Nina years. Also it suggested that this type of behavior is associated with the trailing edge of an El Nino rather than the genesis phase. So all of that intrigued me. You can see that in the rapid change in the 6 – 14 day forecast since what was issued on Monday. I have read this papers so I think I know what he is going to say. I do not think he agrees with you completely and may attribute more of the hiatus to the PDO and AMO than you would, But he clearly believes that IPCC Climate Change sensitivity estimates are way too high for reasons that are similar to yours but not identical. I hope he is reading your blog or WhatsUpWithThat which I suspect he does. I can’t see how they would confirm or contradict. The paper you supplied discussed tendencies, not absolute behaviors. Also, please do not assume the brevity of my replies means anything. I’d noted about a year ago that the sea surface temperatures of the North Atlantic haven’t warmed for more about a decade, so there’s no contradiction there. Then again, people use the term PDO to express many things other than the PDO represented by the JISAO PDO index data. I have his paper and if you want I will post it. He may be presenting some new data…I do not know. Note he is only talking about the Southwest. I probably will not ask any questions but I could ask him if the correlation between the PDO and ENSO might mean that if he substituted ENSO for PDO he would get the same results. I could ask him why he has gotten different results than McCabe et al. But I think I will just focus on eating my lunch and ask those questions privately by email. .
Sig Silber, it’s well known that the ENSO, PDO and AMO “modes” have influences on regional precipitation. My argument against the PDO (the JISAO definition) is that there is no mechanism for it to alter global surface temperatures. Just clarifying. I follow your argument but do not totally agree especially if one is talking about a subset of the globe as opposed to the total globe. Changing the location of convection and precipitation impacts local climates. As it turns out Petr Cheylek does not conclude that the PDO has a significant impact on the temperature of the Southwest and he is only talking about the Southwest. He does seem to partially agree with the TOA theory of Global Warming but thinks the estimates of sensitivity are too high if I recall correctly about double what they should be. So I will not speak for him but he appears to be somewhere between you and the so-called consensus. He is approaching things from a different angle to a large extent as his approach is primarily statistical. One thing that is missing from your PDO analysis which is in your ENSO analysis is the extent of surface area that is warm during the various phases of the PDO. I think you have it pinned down pretty well for ENSO. Also there is no MOC with ENSO but there is MOC with AMO and to a lesser extent with PDO. It seems to me that we have a lot to learn. I like your approach because it is fact based. I attended a workshop on shale yesterday and it was interesting to be able to see the multiple rises and fall of sea levels in the Permian Basin during a 2 million year period. I assume that was mostly obliquity, eccentricity and precession all very slow processes usually lumped together as part of Milankovich Cycles. It seems to me that we were headed into another ice age prior to the Industrial Revolution so I fall into the Anthropogenic Climate Change Camp on that basis. But I also think their computer models are all screwed up at least in terms of what they call “internal variability”. So I think your work on understanding ENSO is very important. But there are many climate cycles. Here in the Southwest we have a fairly vaguely defined and totally non-understood 400 year cycle which I know about in terms of archaeology. It would appear that there is a strong climate component of that cycle and it predates the Industrial Revolution. Saturday 2 August 2014 / Hour 2, Block A: Eric Cline, Author “1177 B.C. : The Year Civilization Collapsed,” and there seems to be a 50 year drought in there. So that might be anthropogenic but not GHG but certainly very interesting. I need to get a hold of that book. So I think we have a lot to learn yet and I have not drawn many conclusions other than that you have figured out ENSO. I hear that thermal activity is increasing at Antarctica and I wonder if that is or will impact the Humbolt Current etc etc. So to me I think we are in the third inning perhaps of understanding this. My main interest is the economic impacts and I was very disappointed that IPCC AR5 WGII did such a poor job of quantifying them. It is not clear that wetter and warmer is less desirable than the current climate. If if you assume that oceans are warming you end up with E-P over oceans increasing forcing P-E over land to also increase. I assume that all extremes are bad but in the middle of the distribution it is a wild assumption that where you are at present is the optimum. There is a secondary issue that may actually be quite important which is the needed rate of adaptation may be faster than ecosystems are good at. I think that is a valid concern since migration is perhaps more difficult now than it used to be but I do not believe that strangers were generally welcome at any time in history and we now have the ability to move food to people as an alternative to moving people to food. .
Keep up the good work and I look forward to Monday’s update. I have read Part 5 and I fully acknowledge that for me it takes perhaps six readings to really understand what I am reading but in a way you have weakened your argument by making the point that the PDO does not measure SST but simply in is an index of contrasts and one that is normalized. Curiously it is not called a dipole which also suggests that the warm areas are not a mirror image of the cooler areas. I am not saying they are not but so far no one is claiming that they are i.e. equal in spacial extent and appearing without a noticeable lag. None of this is meant to be a criticism of you in any way. It is just not possible for one person to do the work that a large group of people are paid to do but are not doing. So I do not think we really know. And I challenge your statement that there is no mechanism because (and I am not saying there is a mechanism) when you have a process that is spread over a large geographic area, a mechanism that impacts convection, and a process that impacts winds and currents, I think it is a stretch to say that there is no mechanism. If you were to say that so far no one has explained such a mechanism to your satisfaction I would see that as a better approach. A. It does appear that that the Earth has been getting warmer since the Industrial revolution. If that is not correct, then that is the end of the story. B. One can tinker with models and have them fit any set of historical data one wants so basically models are useless for predicting things outside of of the database used to create them..So if GHG is the basis for the theory then if we have higher GHG now than the period of time for which we have good data, the models are essentially useless. That might be a bit too strong but we all know that one can fit data with a wide variety of equations so their predictive ability outside of the range of data used in the calibration is very questionable. C. It is possibly for those on all sides of his debate to debunk the notions of the other side. But debunking around the edges does not get to the heart of the matter. We still have to explain why it is getting warmer. So far we are dealing with 7 year cycles, 20 year cycles and if you want to stretch it: a small multiple of 20 years cycles say 3X or 4X. We can’t explain 1,750 to today. There may be a 400 year cycle but so far it has not been described. If not for politics, I think the AGW concept which I call the TOA concept since it seems to have to do with concluding that there is more incoming than outgoing as measured at the top of the atmosphere would be called a hypothesis not even a theory and certainly not indisputable. But there is politics and even if just a hypothesis it still has to be dealt with. And dealing with it includes coming up with an alternative hypothesis for the recorded warming if indeed such warming is fact. So that is where I stand on this. I am not much of a scientist but I am a pretty good economist and so far I have not found the evidence that warmer and wetter is worse than our current climate. So that is where my research is focused. I only deal width the science to provide a starting point for looking at the impacts. I also write a weather column which soon will be expanded to a full blog within Global Economic Intersection GEI and if i knew how to contact you ( I do not tweet), I would ask you to submit a guest column or allow me to repost one or more of your posts which in way I have been doing anyway but just by posting links. I think your assessment of ENSO is the best out there and a full article on that I think would be good reading. .
Of course most people are not going to read a 14 Part Article which starts with a number of preambles but quite frankly I thought I did a good job of condensing your ENSO discussion into a short discussion of ENSO as a battery in one of my recent columns which I posted on your blog. . But right now I am more interested in what the winter of 2014/2015 will look like, whether or not the PDO and AMO will flip (or have flipped) and other such things that impacts the world economy. How this all fits together to me is not yet clear. I think we have a long way to go. Tomorrow is Monday so NOAA will have more to say.